This is the strongest UMF manuka honey ever reviewed by Manuka Honey World and the editor was not disappointed by this potent class act. Steens are highly regarded as one of the top producers of UMF manuka honey and the business is a family-run enterprise driven by a passion for producing manuka honey in the most ethical and sustainable way possible. 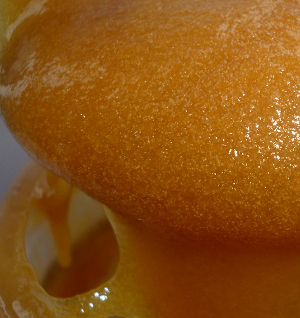 Steens have been at the forefront of new extraction techniques as well as sustainability and ethical practices that are now common among the manuka honey industry, such as paying landowners to keep hives on the land. Steens Raw 20+ Manuka Honey comes with a UMF rating of 20+, which makes it very strong and pure and rather rare as only a limited amount of manuka honey has this strength of purity. The UMF rating refers to the levels of naturally occurring elements that are unique to manuka honey including methylglyoxal (MGO), and a UMF level of 20+ equates to an MGO level of 829+. Steens UMF 20+ Raw Manuka Honey has an unusually intense bouquet for a manuka honey and on opening the jar you get an initial strong smell of toffee followed by the characteristic spicy herb smell of manuka. The colour of this honey is a lovely dark amber brown with streaks of dark toffee and is quite mesmerising on the eye. The honey has an equally intense and complex taste with an initial mixture of spices and herbs like orange peel followed by a sudden sweet toffee flavour and a long after taste on the palate that also has the almost astringent taste that is characteristic of manuka honey. In conclusion this is an intense manuka honey that is more like a taste explosion of sweet toffee and astringent herbs: A delicious and seriously potent and pure manuka honey for the connoisseur. Steens also produce a range of other delicious manuka honey, which you can view here.